Burlappcar: Honda CR-V Hybrid coming to the US. US Spec CR-Vs also come from Canada. Aerodynamics may play a role in lowering the mpg even though the weight is close to the Accord sedan but this really holds promise. I would get in line for one. This is the future for hybrids, not Nero's, Ionic's and Prius's. Hope they get it here this year. CR-V even with current 190 hp is not great on acceleration. 212 will help! Would if the CR-V feel more like a luxury crossover with the electric motors? The only thing we know is that...."And gets 49mpg in the city and 47mpg Why" means 47 highway, but oh...well. Given that the new CRV is bigger, it is likely to allow the hybrid components to be added without affecting cargo space. I am pretty sure it was planned for North America all along. Given that fuel prices are expected to rise, Honda may be laughing all the way to the bank soon. Honda will sell a ton of these and they should be ashamed for not getting into this sooner. The Niro Touring MPG is 46/40. Primarily due to the extra 110 lb. and larger wheels with more surface area. For the CR-V I would guess 37-38 combined. A 17" lower resistance wheel on a 2 FWD version would be a nice option. I'd also like to see the battery placement and if they can fit it in maintaining a the flat cargo area. It could happen if they make use of the '17 multi-level cargo area. if the battery is placed under the seat then it may lose the passenger seat moving down and forward when folded down. - We'll see. The Rav4 has a horrible implementation and the Rogue raises the cargo floor too much. If they take the Nissan route with a $1500 premium for hybrid and offer it on the EX models, it could be a great value getting under $30K. Deleting Nissan sales success posts are very odd. Admitting to it is disturbing. Vince you are losing touch by hiding factual comments that clearly illustrate their success and dominance when it doesn't suit your views or support the brands you like.......odd indeed! 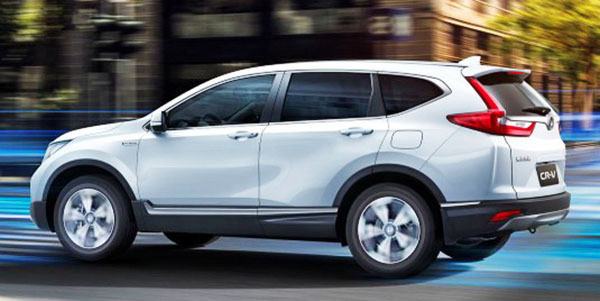 Rogue outsells honda CRV year to date by far and the Rogue sport will assist greatly, Honda, notification, Nissan is going to overtake you within two years!